There comes a time when your child’s baby teeth fall out and are replaced with permanent teeth. Here’s important information to prepare you for when that time comes. Just as it is impossible to predict when your child’s baby teeth will come in, it is not possible to pinpoint when they will fall out. Typically, kids that started teething earlier will also lose their teeth earlier. Baby teeth tend to fall out when a child is around 5-7 years old. 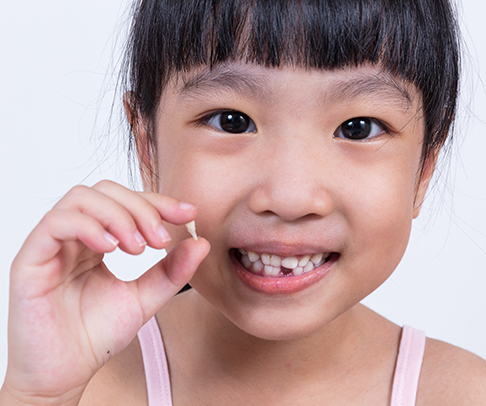 With that said, there’s no need to worry if your child’s tooth falls out a little earlier or later than this. Keep in mind that teeth usually fall out in the same order they came in, which means the first tooth to fall out is generally in the front of the lower jaw. If it seems like it is taking forever for your child’s tooth to fall out, there is no need to be concerned. It can take a few months from the time a tooth becomes loose until it falls out. If a wobbly tooth is bothering your child, you can encourage him or her to wiggle it gently. If the tooth still remains after a few months, check in at The Children’s Dental Center, as it may need to be “wiggled out” professionally. While losing baby teeth is an extremely exciting time for your children, it can be uncomfortable for them too. If your child complains of pain in the back of their mouth or in their jaw, it could be their six-year molars coming in. If your child is experiencing any pain, all-fruit popsicles or ice cold water can help. If the pain persists, it may be necessary to stop by the dentist to see if there are any other issues that need to be treated. Don’t be surprised if your child’s smile looks a bit funny when their permanent teeth begin to come in. Those new, larger teeth can look out of place in that little mouth, but your child will grow into them. Permanent teeth generally have pronounced ridges when they first poke through. This is because they haven’t become smooth through chewing yet. Permanent teeth also tend to be less white than baby teeth. Losing baby teeth should be an exciting adventure for you and your child. As your child’s permanent teeth grow in, it is increasingly important to take good care of them. Make an appointment at The Children’s Dental Center today to ensure your little one’s teeth stay healthy for a lifetime.